Our hair is in some sense a window to the condition of our health. There are many different factors that can affect hair health such as hormonal imbalance, illness, poor nutrition and major stress. All these factors can lead to hair loss problems. If you are one of many that are experiencing baldness, you need to get to the core of the problem in order to determine the best treatment. Alopecia areata is a medical term for hair loss and there are various treatments available. However, when it comes to unique and latest hair loss treatment these days, scalp tattoo micropigmentation is definitely number one and very popular solution among men. This new revolutionary treatment for hair loss is a simple procedure of having a scalp tattooed with tiny dots that give the appearance of a shaved head style. Scalp tattoo micropigmentation is a fast non-surgical solution to hair loss and there is no down time and no scarring. While there is a big hope for men who are suffering from hair loss, there is a perfect solution for those who are completely bald. This unique treatment gives you the look of shaved hair. 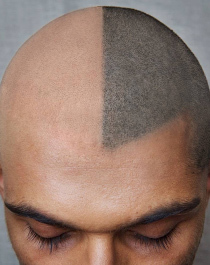 Scalp tattoo micropigmentation can also be used to shade small ares of your head or camouflage areas where hair is thinning in order to make hair appear thicker. Tattooed hair hair loss treatment does not penetrate the skin as deep as typical tattooing and the colour used can be matched to your natural hair colour as well as skin tone. Unlike normal tattoo, the colour does not change with time, which means you will not end up with red dots on your head years later. The person specialized in scalp tattoo micropigmentation will create new hairline based on the shape of your face and your previous hairline. Then, he/she will make very tiny dots all over your scalp. The whole tattooed hair process usually lasts around three hours. The treatment is constant, but it can be adjusted as well. If you are concerned about pain, know that scalp tattoo micropigmentation hurts less than regular tattooing and far less than hair transplant. There are anesthetics used to numb your scalp, but most candidates often do not require anesthesia. When it comes to price, it can vary depending on the area that needs to be treated and the specialist that handles the procedure. There are specialized clinics that provide this treatment that have highly trained team of professionals and latest equipment available for making tattooed hair.